And we towards Tatiya Sthan, the ashram of Swami Haridas (Guru of Tansen and Baiju Bawra). Swami Haridas stayed at this location but for bhajan he used to visit Nidhi Van or the banks of holy river Jamuna. We all know the image of Bihariji (Lord Krishna) present within Shri Banke Bihari ji mandir is the one that was presented by Lord Krishna to Swami Haridas at Nidhi Van. Mughal Emperor visited Vrindavan to listen Swami Shri Haridas. The ashram is full of white sand, trees, monkey, parrots and no electricity. Photography is not allowed inside but yes one can but outside only. I left slippers at side and a walk over white sand – excellent to walk. Pure natural – no doubt and monkeys passing-by. Neem, Kadam, Jamun, Papri, Peepal, Khajur all such trees resemble Thakur ji i.e., Lord Krishna if utmost pure devotion is present within a person. One such example is shown by a devotee – The hanging branches known as Jhula of Lord Krishna and many such that inspires devotion surrender towards God. Most important nobody is allowed to do any such activity that harm trees, plants. Even fallen leaves, branches are not burnt but dump inside a deep well present within the ashram-area. Radha Bihari Das – Swami ji was present. It was evening hours and we along with few more devotees sat in-front of him to listen bhajan. Holi days were not too far few lines were remembered from the bhajan as Ram Krishna helped to remember the words. And a strange at least I never saw that. A devotee call with loud voice for evening Aarti for the people living outside the ashram-area and within minutes ashram was packed with devotees ready to be present for aarti i.e., prayers. Old days when there were no loudspeakers I guess this was the only way to send message. Impressive. History was present at least I felt the same. Few aarti lines I remember but what I till-date remember the ambiance, the location never experienced before. Devotees residing within the ashram-area covering faces with sandalwood paste and applied Braj Raj (Vrindavan dust) as well. No electricity within the ashram. No materialistic world inside. 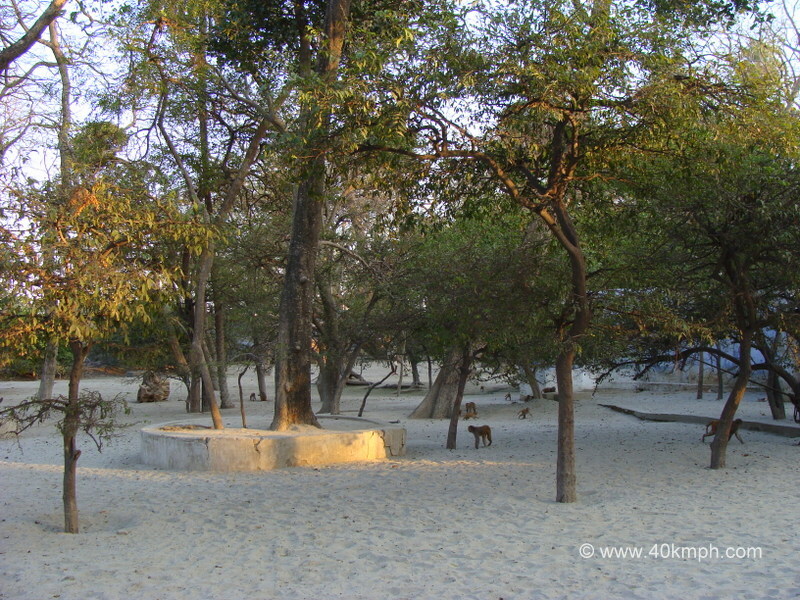 Devotees, Trees, Animals, Sand and Lord – Thats it. A must visit ashram if you are visiting Vrindavan. Will visit again for sure – said I.
Mohini Bihari ji Mandir, Vrindavan is also known as Mohini Nikunj. « How to Get to Rishikesh from Haridwar Railway Station?